For Cupcakes: 1. Preheat oven to 350°F. Grease and flour insides of 12 muffin cups or insert paper liners. 2. Mix molasses, hot water and baking soda together in a large bowl. Cool to room temperature. 3. With electric mixer, cream butter and brown sugar until fluffy. Beat in egg. 4. In a large bowl, sift together salt, ginger, cinnamon, flour and baking powder. In three additions, alternately add dry ingredients and molasses mixture to butter mixture. Mix thoroughly after each addition to make sure there are no lumps. 5. Evenly divide batter between cupcake molds. Bake until a toothpick inserted in the middle comes out clean, about 20 minutes. Cool for 15 minutes. Remove the cupcakes from the pans. Cool completely before frosting. For Frosting: 1. With an electric mixer, beat cream cheese until smooth. Add butter, sugar and vanilla extract. Beat until smooth. If cream cheese is very soft, refrigerate for 30 minutes. 3. 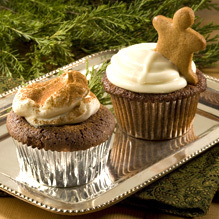 Place a gingerbread-man cookie on top of frosting or wedge the cookie into each cupcake.